Unique opportunity in a premium Mojácar Playa location and with the sea just across the road! 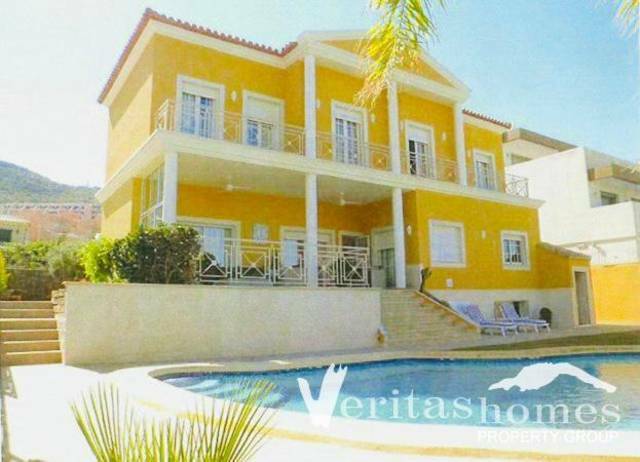 Nicely designed sea facing 5/4 bed / 4 bath detached Villa very close to the “Parador” Hotel in Mojácar Playa. The property is set on a 1,000mts² free hold plot, accessed via a private road and has a total built area of 491,51mts² distributed on three levels. The property is fully fenced / walled and has two double gates with wooden pergolas to house at least 2 cars. Inside the house, on the ground level there are a large reception room with high ceiling and a wide stairwell that leads to the gallery on the upper level, a large seating/living room with lovely pool and sea views, large kitchen, dining room, back terrace, cloakroom, large covered front terraces, an annex with independent access and its own kitchen and en suite bedroom; upstairs, other than the gallery there are also 3 double bedrooms, an office, 2 bathrooms and terraces with very fine sea views. The basement is huge and therefore has spaces for a few cars. Some of the area in the basement could be used as a games room, wine cellar, cinema, etc. in fact here there is a bathroom already fitted. The property also has air conditioning on all bedrooms, office and kitchen and the entire property benefits from gas fired central heating. The bedrooms also have built in wardrobes. One of the benefits of this house is that it is very secluded and has the beach virtually just across the road. The Commercial centre, medical centre, secondary school, banks and supermarkets are all nearby.